UNITED IN FAITH is a grass roots group of orthodox Christian community churches, musicians, and faith-based organizations, into which all orthodox Christian denominations are invited; uniting to work together, side by side, in love and fellowship, that all may be reconciled unto God. 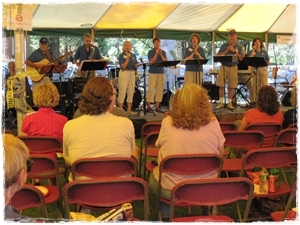 An annual outdoor music festival and other events throughout the year entreat the Holy Spirit to bear fruit among us, that all may know we are Christians by our love for Jesus Christ and for one another. UNITED IN FAITH further believes that the Holy Scriptures of the Old and New Testaments are the rule and ultimate standard of the Christian Faith containing all things necessary to salvation and that Jesus Christ is the head cornerstone (Ephesians 3:20) of His church . We make a conscious decision to obey God and to follow Jesus in all circumstances of our lives! “Obey My voice, and I will be your God, and you will be My people; and you will walk in all the way which I command you, that it may be well with you” (Jeremiah 7:23).